The electronic Ural Mathematical Journal (UMJ) is a high standard peer-reviewed electronic journal devoted to rapid publication of innovative research which covers the fields of Mathematics, Mechanics and Theoretical Computer Science, Computer Engineering and Optimization and Control Theory. We hope that the Ural Mathematical Journal will help russian and foreign experts to exchange ideas, to establish new scientific contacts and to do important joint researches. Pure and Applied Mathematics and Mechanics in general, with a certain emphasis on innovative researches which cover the fields of Modern Mathematical Analysis and Theory of Functions, Algebra, Approximation Theory, Regulation Theory and Applications, Inverse and Ill-Posed Problems, Nonlinear Analysis, Control and Optimization Theory, Game Theory, Fractional Calculus and Applications, Modeling for Optimization and Control, Linear Programming, Nonlinear Programming, Stochastic Programming, Parametric Programming, Discrete Programming, Dynamic Programming, Nonlinear Dynamics, Stochastic Differential Equations, Applications related to Optimization and Engineering. The journal was founded by the Institute of Mathematics and Mechanics named after academician N.N. Krasovskii of the Ural Branch of the Russian Academy of Sciences (http://imm.uran.ru) in collaboration with the Ural Federal University named after the first President of Russia B.N.Yeltsin (http://urfu.ru). The Ural Mathematical Journal was founded in 2015 as an electronic scientific publication. 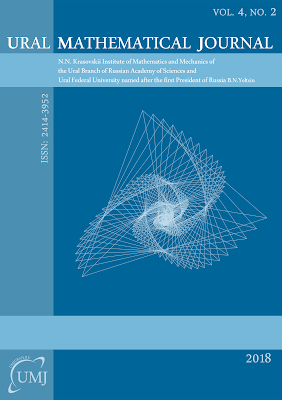 The Ural Mathematical Journal is registered as a scientific periodical publication by the Federal Service for Supervision in the Sphere of Communication, Information Technologies and Mass Communications (Certificate of Registration Эл № ФС77 - 61719 of 07.05.2015). The Ural Mathematical Journal is registered by the International Standard Serial Numbering Center with the assignment of the international standard number ISSN 2414-3952. Each paper in the journal is assigned a DOI (Digital Object Identifier). The journal is periodical, it is published 2 times a year, in July and December. All papers submitted to the editors are necessarily reviewed by experts of the highest level. Papers are accepted written in English. All articles contain detailed annotations. Publication for all authors is free. The full-text version of the journal is in the free access mode on the journal's website. Also, the journal's materials are placed on the platform of the Russian Scientific Citation Index of the Russian Universal Scientific Electronic Library eLIBRARY.ru and on the all-Russian mathematical portal Math-Net.Ru. The journal Ural Mathematical Journal is included in the database MathSciNet (Mathematical Reviews). The journal Ural Mathematical Journal is included in DOAJ (Directory of Open Access Journals). All the contents of the journal, except where otherwise noted, is licensed under a Creative Commons Attribution License. The Scopus review of the Ural Mathematical Journal is completed on March 11, 2019 and the Content Selection & Advisory Board (CSAB) has advised that the Journal will be accepted for inclusion in Scopus. Within the next three months the Journal papers indexing process for Scopus will be initiated.